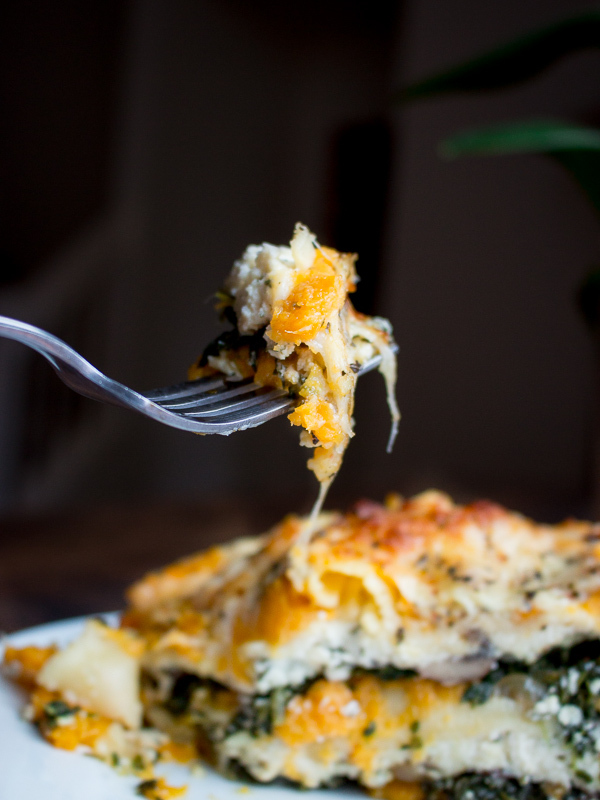 Your first bite of Butternut Squash Vegetarian Lasagna and you are going to be in love. Today we are having the leftovers for lunch and will be sad when that casserole dish is empty. 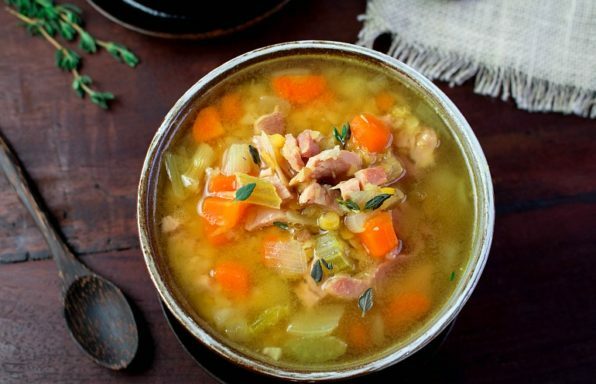 When the cooler weather arrives, all we want is comfort food. There is no better comfort food in the WORLD than the humble NOODLE! Lasagna noodles are the perfect portable device to get all that deliciousness in your mouth in one neat stack. We don’t just love lasagna noodles, we love different types of noodles from all over the WORLD. Healthy World Cuisine has partnered with Jas from All That’s Jas. We are here to bring to you a delicious NOODLE recipe the first Tuesday of Every month. Lucky, you as it is Tuesday. Two Noodle Dishes and two bowls of comfort food! Check out All That's Jas' Pumpkin and Goat Cheese Pasta Bake for more deliciousness. We invite you to join in on all the noodle fun as we love seeing what you are cooking in the kitchen. Use the hashtag #NoodlesWithoutBorders any time you post a noodle recipe on Instagram, facebook, pinterest, twitter or any social media. Join in on the fun. Whether you are a dad making macaroni and cheese for their kids, a seasoned cook or eating out at a delicious noodle restaurant, please show us what kind of noodles you are eating. Your photos do not have to be fabulous, they just need to real like the real crazy life we live. (flip phone photos welcome…. Smiling) What is your favorite Noodle dish from around the world? Can solve a lot of your problems with entertaining. 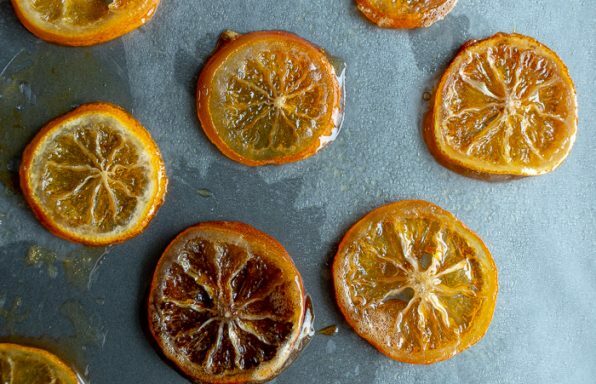 You can make this recipe in advance and then bake just before your guests arrive. You can even bake it you like and then just reheat. Even more delicious the next day when the flavors have a chance to mingle. The one problem we always seem to encounter is someone with a food allergy or food preference that does not involve meat. 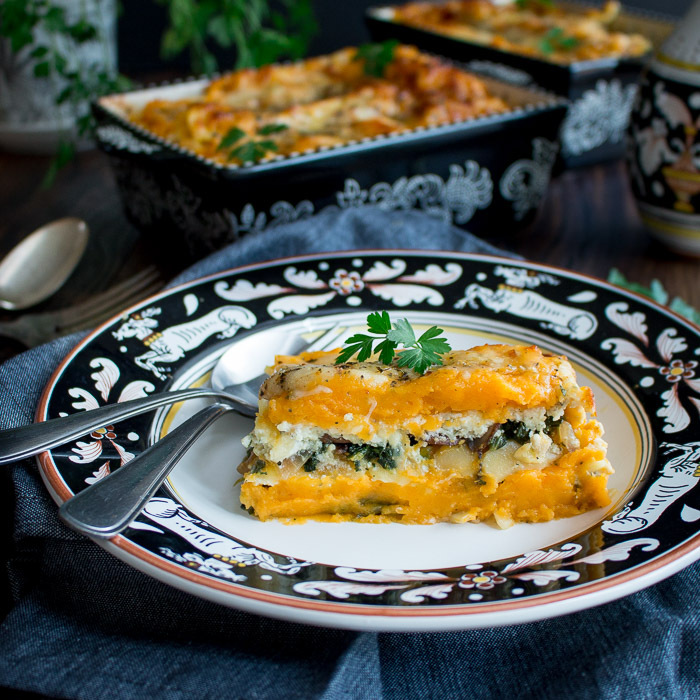 Butternut Squash Vegetarian Lasagna is of course vegetarian and gluten-free. 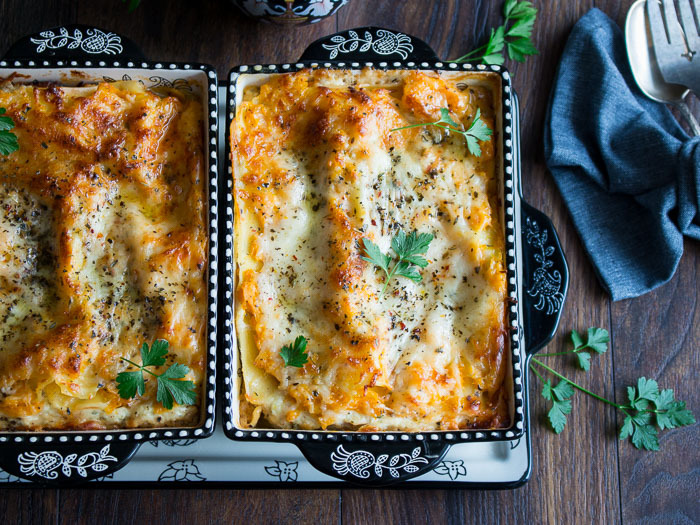 If you need to make this recipe dairy free or vegan, we encourage you to check out our post for our Vegetable Tofu Ricotta Lasagna. Trust us, you will never know it is made with tofu. 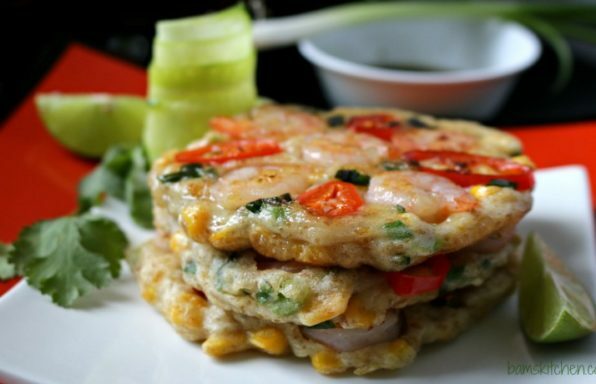 In addition, you can also make this recipe in advance as well. 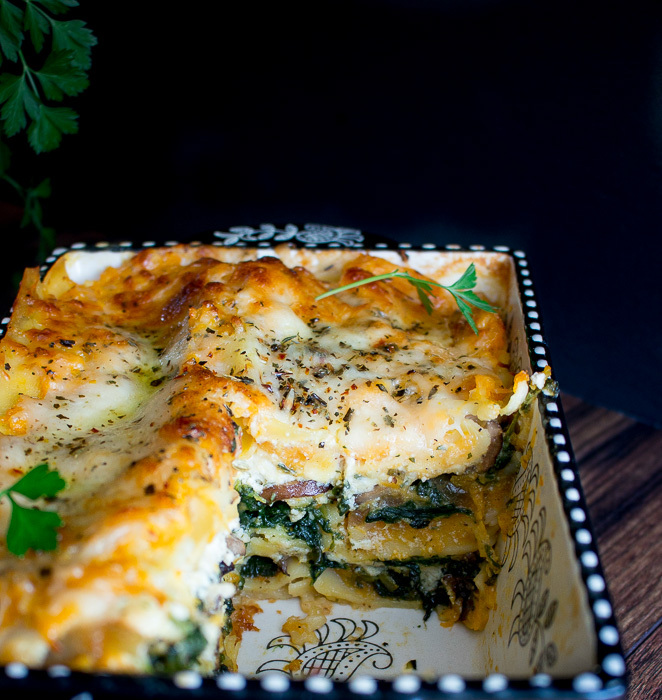 You can also make our Butternut Squash Vegetarian Lasagna vegan. All you need to do is to substituting the ricotta cheese, parmesan and mozzarella cheese mixture with firm tofu and mix your spinach within the tofu mixture. Of course, you can also use vegan cheese, if you are to that kind of thing. Another fabulous vegan side dish is our Best Vegan Warm Swiss Chard Lentil Salad. Honestly, we could make a meal just out of this dish alone. Did you know that sometimes if a person is dairy sensitive (bloating, diarrhea, gas, etc.) they might fare better with “goat cheese” ricotta? Goat's milk is homogenized naturally. Hence, the fat globules are small and remain suspended in the milk rather than separating out. This, generally speaking, makes it easier for people to enjoy goat milk products. However, in cow's milk, homogenization is done through processing and the fat globules are larger and make it more difficult to digest. Please note that there is a HUGE difference between Dairy Intolerance (just feeling a little uncomfortable) and Dairy allergy (hives and leading up to an anaphylactic reaction). If you have a dairy allergy you should avoid all milk products. Italian dishes like our Butternut Squash Vegetarian Lasagna are all about using quality ingredients like good quality extra virgin olive oil. We love Mie Radici Extra Virgin olive oils and their Sicilian Spice blend. Mie Radici is family owned business and they have delicious quality products. Their olives are grown in the Agrigento region of Sicily by family members and other small producers and are cold pressed. They have 2 different types of EVOOs, Cerasuola ‘Olio del Contadino’ (Farmer’s Reserve) and the Nocellara Organic Reserve. We love the Cerasuola ‘Olio del Contadino’ for dipping and for salad dressings. We love the Nocellara Organic Reserve as a delicious finishing oil. 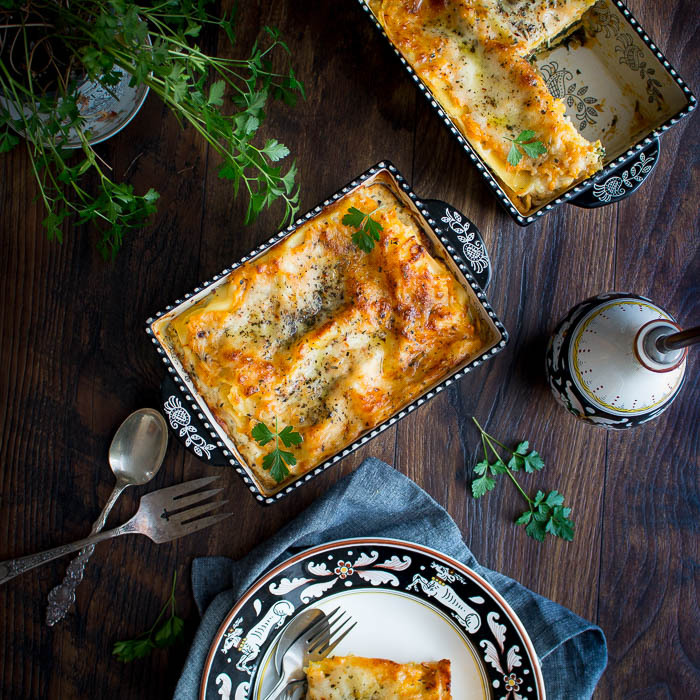 We love drizzling a little EVOO on the lasagna just before serving. Of course, you could cook with these olive oils but when they taste this good we like them to be the star of the show. 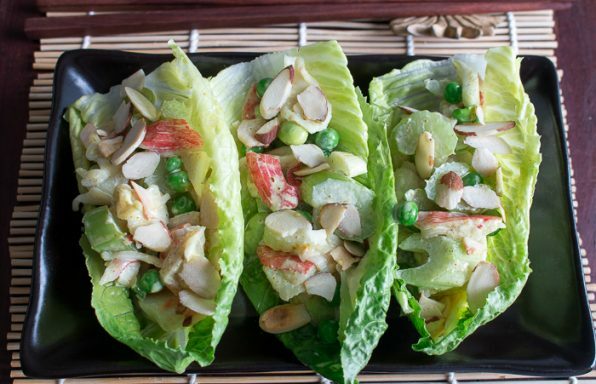 We know it seems like this recipe has loads of steps but really all of them are super easy. If you are not a food photographer that has to get step by step shots every step of the way, you can get your prep done with little fuss. However, we have some time saving steps we learned along the way and want to share with you. 1) Butternut squash is difficult to cut, peel and chop. A huge time saver is to use frozen butternut squash puree, frozen butternut cubes or even just pre-cut and peeled butternut squash so that you can roast yourself. 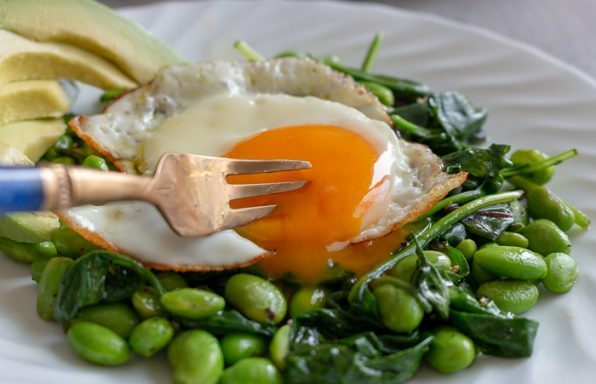 3) Either frozen thawed spinach squeezed dry or fresh spinach both work lovely in this recipe. 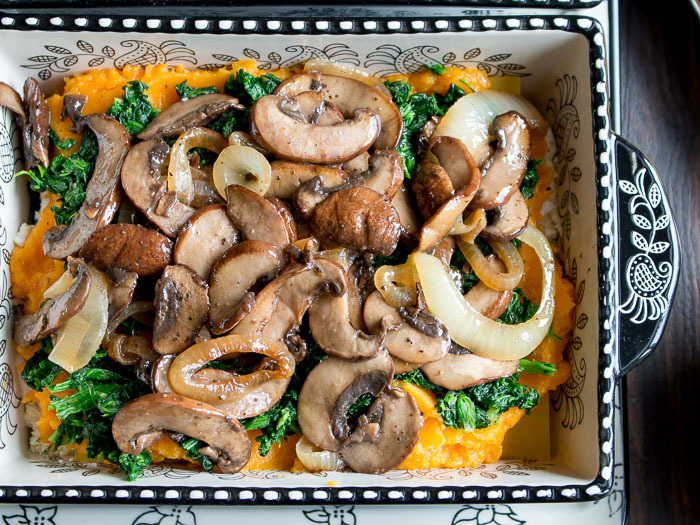 4) We used mini portobella mushrooms in this recipe because that is what we had but button mushrooms, chanterelles, you name it would be delicious in here. 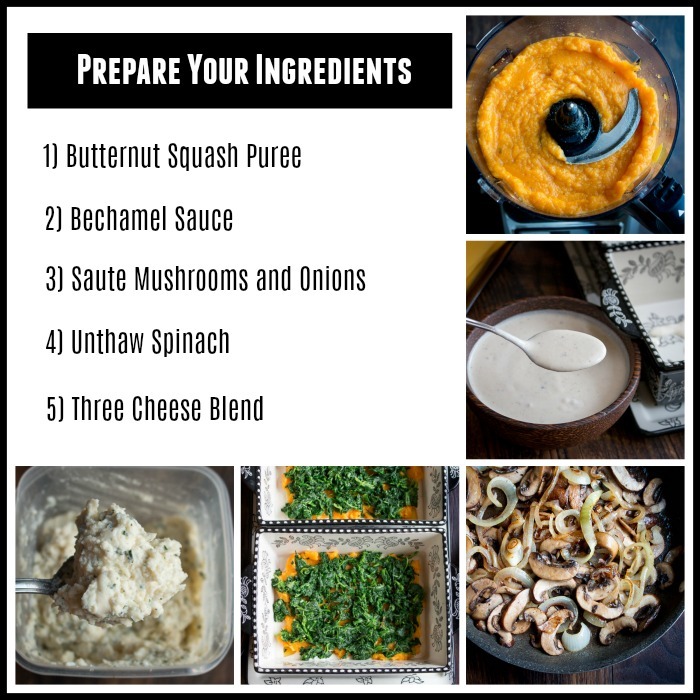 5) You can sauté your mushrooms and onions the day before, prep your butternut squash and mix your 3-cheese mixture the day before. 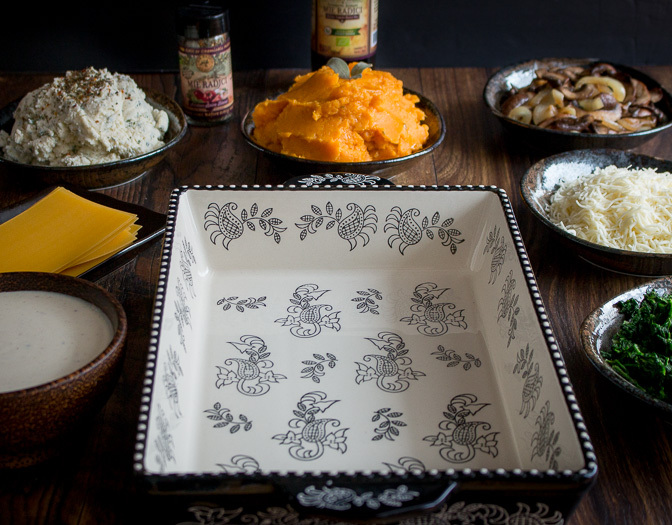 6) Feel free to assemble the day before and bake the day your guests arrive. 7) Butternut squash vegetarian lasagna also freezes great. We like to bake it first. Allow it to completely cool. Slice and place in a sealed container for the freezer. Use within 2 months. 8) Recipe makes a 9 inch x 13 inch pan. Our was about 3 and 1/2 inches deep. 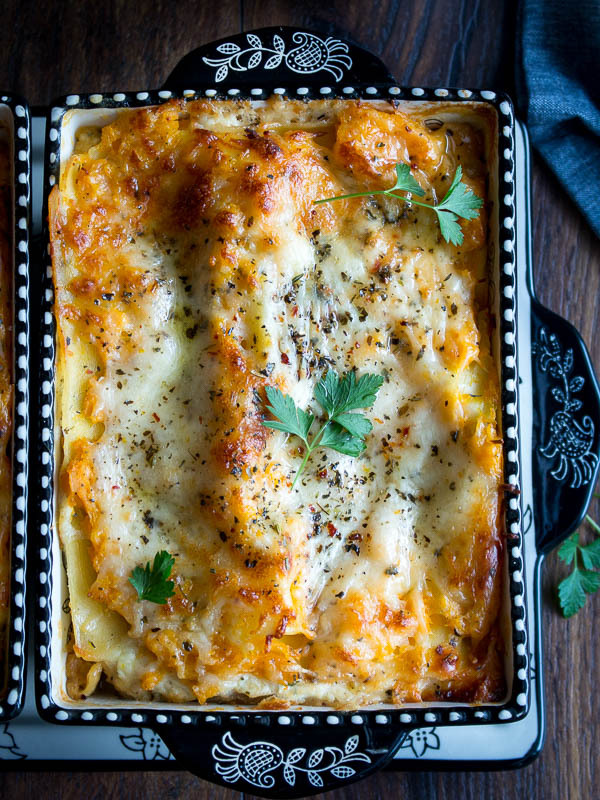 We hope you love this Butternut Squash Vegetarian Lasagna as much as we do. 2In a frying pan add olive oil and sliced onions and saute until golden brown. Add mushrooms and salt and pepper and cook until tender and slightly golden about 5 minutes. Set aside. 4In a medium sauce pan add butter and flour and saute for about 2 minutes until slightly golden and the flour is cooked. Slowly with a whisk add you milk a little at a time whilst stirring to prevent lumps until smooth and creamy. Add nutmeg and salt and pepper to taste. Set aside. 6Spray your 9 x 13 inch pan on the bottom and sides with spray oil to prevent sticking. 7Spread a few tablespoons of the béchamel sauce on the bottom of the 9 x 13-inch casserole dish and spread. Next place 4 lasagna noodles overlapping a little on top of the béchamel sauce. Spread 1/3 of the butternut squash mixture over the lasagna noodles. Next layer 1/3 of the spinach on top of the butternut squash. Next add 1/3 of the caramelized onion and mushroom mixture on top of the spinach. Next add 1/3 of the three-cheese mixture on top of the spinach. Next add a few tablespoons of the béchamel sauce on top of the three-cheese mixture. Repeat this process 3 times for a total of 3 layers. 8Sprinkle the top of your Butternut Squash Vegetarian Lasagna with mozzarella cheese and sprinkle with a little extra Sicilian seasoning. Cover with aluminum foil. Bake for 45 minutes covered. Remove the cover off the lasagna noodles and check with a knife that the noodles are aldente and tender. If not, put the aluminum foil back on the lasagna for a few more minutes until easily pierced with a knife. Next remove aluminum foil and cook uncovered for about 15 minutes or until golden brown. 9Remove from oven, allow to cool between 15- 20 minutes before slicing. Drizzle with a little extra virgin olive oil, if desired and enjoy. 10CHEF NOTES: Feel free to use fresh roasted butternut squash for frozen if you have the time. If you want to make this recipe vegan, replace the 3 cheeses (ricotta, mozzarella, parmesan and eggs) with firm tofu pureed along with the Sicilian spices and the spinach. Feel free to assemble your lasagna the day before and then baking when your guests arrive. This recipe freezes well. 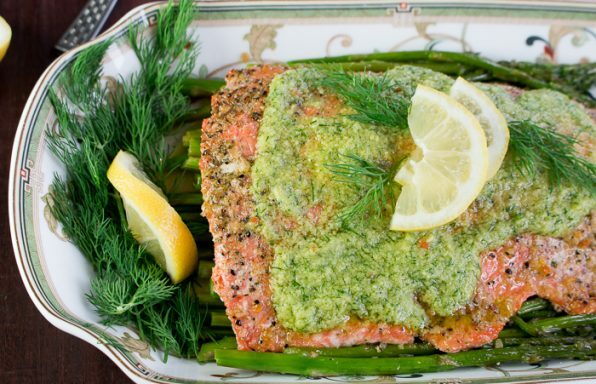 After cooking and cooling allow to cool and slice and place in a freezer safe sealable container. Can be stored in freezer up to 2 months. 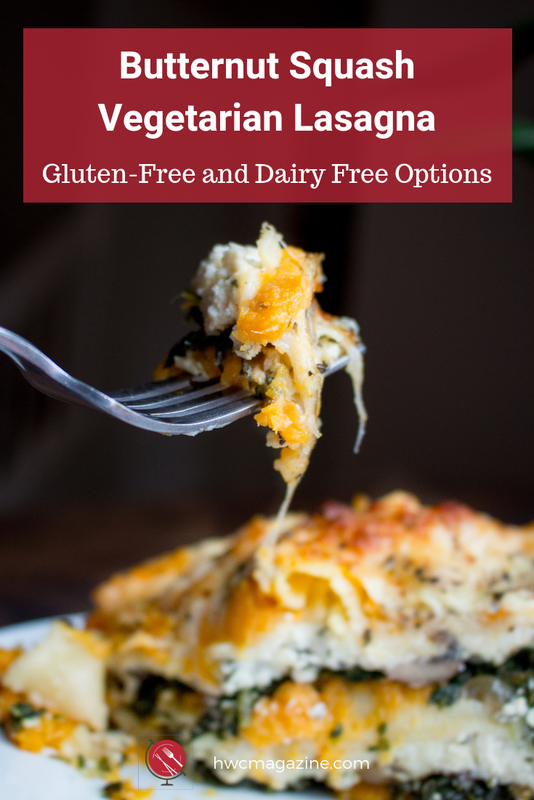 If you do not need the recipe to be gluten free feel free to use regular wheat based lasagna noodles and regular all-purpose flour for your béchamel sauce. 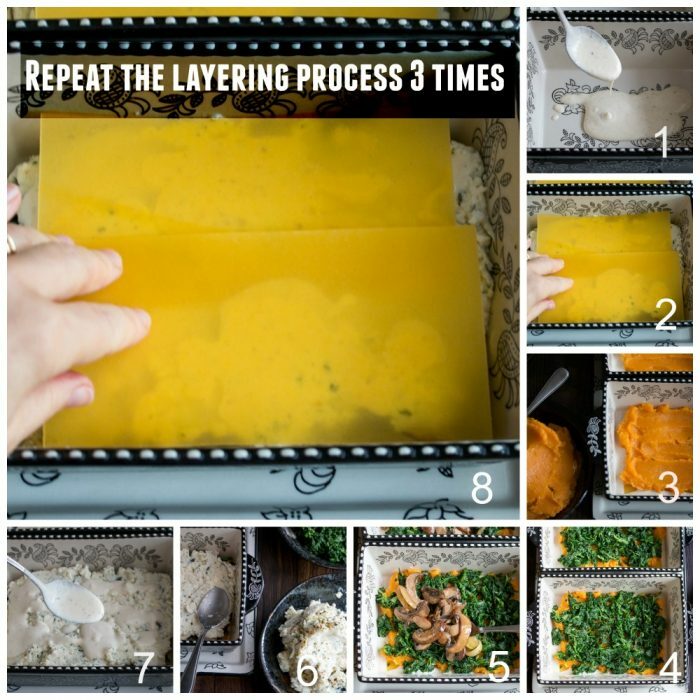 Be sure to check out our Step By Step photos in the post as a good visual for layering your lasagna.